No one gives you the Caribbean like Royal Caribbean®, with unforgettable new experiences ashore and endless activities onboard. From delectable dining and dazzling entertainment to thrilling activities for all ages, you won't find adventures like these anywhere else. Like a skydiving simulator and the first-ever bumper cars at sea. 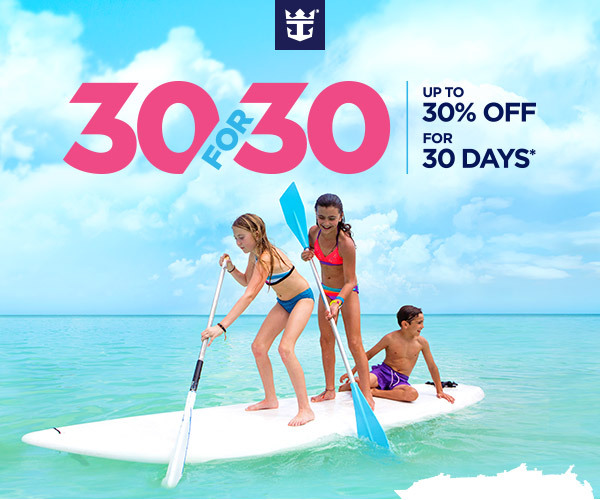 And with our new 30 FOR 30 sale, you can see it like never before and enjoy up to 30% off. Plus choose from hundreds of sailings—even on our newest ships. HURRY! THIS OFFER IS ONLY AVAILABLE FOR A LIMITED TIME. CONTACT YOUR TRAVEL AGENT TODAY! Contact your travel agent for complete terms and conditions. Prices are average per person, cruise only, based on double occupancy and reflect promotional discount. Cruise must be booked June 1-30, 2015 (the “Offer Period"). Offer applies to sailings departing on or after August 1, 2015. Offer excludes China sailings, as well as Anthem of the Seas sailings departing before April 29, 2016. Offer includes a percentage off of the standard cruise fare for the first and second guest in a stateroom. Savings amount is based on the stateroom category purchased: 10% for interior, 20% for oceanview, and 30% for balcony and suites. All other charges, including, but not limited to, taxes, fees and port expenses, are additional and apply to all guests. Savings will be applied automatically at time of booking. Offer excludes third and higher occupancy guests. Offer is combinable with Crown & Anchor discounts and NextCruise offers. Offer is not combinable with restricted rates (for example, Seniors, Residents, Military) or any other offer or promotion, including, but not limited to, Standard Group, Interline, Travel Agent, Travel Agent Friends and Family, weekly Sales Events, Net Rates, Shareholder Benefits. After the Offer Period, the Offer will be removed from the booking if the guest cancels and reinstates the booking, applies a fare change, or changes the ship or sail date of the booking; certain other changes to the booking may also result in removal of the Offer. Offer applies to new, individual and named group bookings confirmed at prevailing rates. Individual reservations can be transferred into an existing group, assuming required criteria are met. Single occupancy guests paying 200% cruise fare are eligible for Offer. Single occupancy guests paying less than 200% cruise fare will be eligible for a prorated value of the Offer. Offer available to residents of the United States or Canada. Prices and Offer are subject to availability and change without notice, capacity controlled, and may be withdrawn at any time. Royal Caribbean International reserves the right to correct any errors, inaccuracies or omissions and to change or update fares, fees and surcharges at any time without prior notice.